In 1837, Soren Kierkegaard wrote there were two ways of telling stories to children with "a multitude of false paths in between". I suspect with graphic novels the problem for me is that the graphical content cannot bestow a beneficial calm, and this is because, put as simply as possible, the novels that drew me into reading (and thereby bestowed calm) were adult novels aware of what they cannot contain, an awareness necessary to form and content (Proust's would be the earliest example) which nevertheless sought that lack against nature. And the addition of graphics to a text is a shortcut, an unwitting act of insincerity. Perhaps I was too far from childhood fascination to maintain ready access to it, while those readers with an uninterrupted passage from the freedom of childhood books to reading for social integration and acceptance feel drawn to the beneficial calm afforded by the gesture of sincerity implicit in graphic novels, even if that means they are told, inevitably, by someone who knows the stories are not true. Kierkegaard contrasts the two paths of storytelling to the false paths which "crop up by coming beyond the nanny position but not staying the whole course and stopping half-way". But how can modern writers stay the whole course if full transparency means knowingness inimical to fascination? It can't be a coincidence that the most popular children's books of recent years – JK Rowling's and Philip Pullman's – are enjoyed by many of the same readers, albeit "ironically". Postmodernists need sincerity too. Thomas Bernhard's story for children, Victor Halfwit: A Winter's Tale, first published in Austria in 1966 with the subtitle "a winter's tale not just for kids", and now translated by Martin Chalmers and published by Seagull Books in an extraordinarily extravagant illustrated book, may be an example of Kierkegaard's false path. Had it been closer to a graphic novel, it may have found one of the other two. 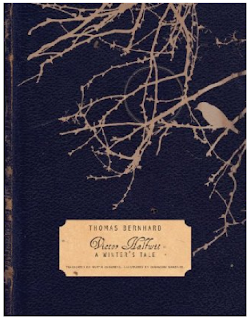 The story itself is typical Bernhard: dark and charming, brutal and funny, moving and disturbing, all at the same time. That is, not each of these in turn but all at the same time. A doctor in Traich is walking to Föding through the "high forest" late one night – "this is what you have to picture" he says, the time of night is important – on his way see a patient with "an ailment of the head", when he stumbles upon a man lying in the snow, unable to move. From his prone position he introduces himself as Victor Halfwit, a man with two wooden legs: "the locomotive tore them from my body!". Victor is delighted as, had the doctor not arrived just then, he would surely have died of the cold and, "as you know, the most horrible death occurs when one freezes to death." You can expect children to love this. The rest of the very short story is taken up with Victor's explanation of how he came to be trapped in the high forest and what the doctor does to help him. I've noted before how interrupted routines, particularly interrupted walking routines, recur in Bernhard's fiction: the early novel Gargoyles and the later novel The Cheap-Eaters are not included there but suit comparison with Victor Halfwit, the first featuring a doctor on his rounds meeting grotesque characters, the second a scientist missing one leg changing restaurants on a whim. 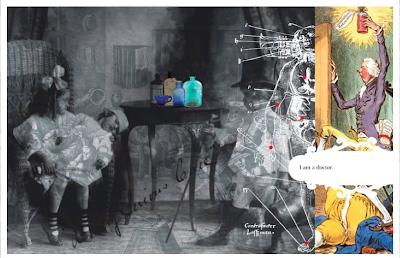 So what difference does having illustrations make to the Bernhardian experience? One particularly effective feature is emphasis of the comedy. The doctor notices that Victor is even more delighted when he learns of his rescuer's profession. He is happier than if he had been a plumber, an electrician, a baker or a farmer. In a normal book, this information would take up two lines of text, three at most, which one would scan without pause. Here it covers ten pages! Two pages count for the doctor's comments, then there are two for each profession mentioned. On first reading, each page provokes smile upon smile as the unnecessary excess increases. Each page-turning pause is a perfectly-timed caesura. Yet while the collages representing each profession in the abstract are impressive and fun, they seem more decorative than illustrative. (You can see more at Sunandini Banerjee's Facebook page.) Had each been related directly to the story and the interaction of characters, I wonder how much more captivating they would be. A regular graphic novel reader, one for whom illustration itself is a narrative, would be a better judge. Perhaps they would be enchanted by the illustrations just as I was by the Ladybird books. However, I longed for the straightforward representation offered by the latter. In the former, nowhere is the doctor or Victor Halfwit depicted. Sometimes there was little compulsion to look at anything but the words before turning the page. Perhaps, however, if they had been depicted, each caesura would have been missed as one studied the relation of one character to the other before reading the text. Late on, there is a two-page spread featuring eight wooden grotesques in a distinctly medieval Germanic style, one of whom I decided looks like Victor Halfwit. This emphasised to me what the rest refuses and which I missed. Perhaps though, as the doctor says: "this is what you have to picture". A fascinating account of reading -- particularly your reflections after Kierkegaard (the idea of gestures of sincerity). & I am curious: were you read to by your parents? I wasn't. No, I wasn't either. Anyway, I much preferred TV and football at the time. Again, great piece, Stephen. That opening paragraph would be a great opening for a novel--hell, the whole thing would be a great opening. I'm just saying. More? Many thanks Todd - always good to hear from you. Did the images inside the cover have a similar effect? Inside the Ladybird Books? I have no memory of them, or indeed if there were any. 'That opening paragraph would be a great opening for a novel' - exactly what I thought. Thank you for drawing my attention to it, Steve. Just received my own copy and it is magical. 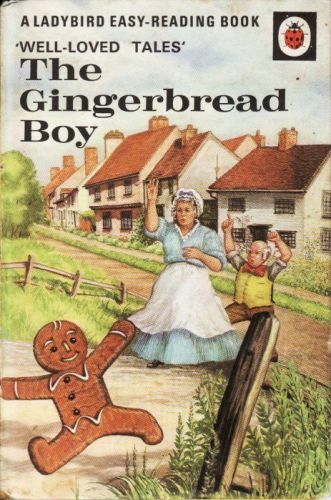 Seeing The Elves and The Shoemaker has reminded me of how much I loved that cover as a child. I have no idea what age I was but I have a visceral memory of stroking the shoes on the cover. I think the elves frightened me a bit. Thank you for a lovely article. Wow, seeing the cover of these books was a blast from the past! 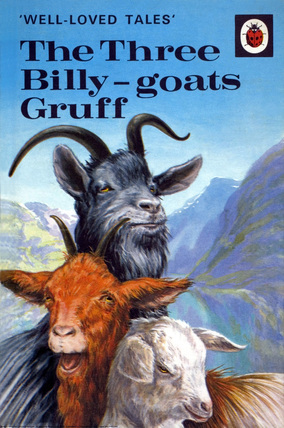 I never liked the picture of the gingerbread boy but adored the picture and story of 'The Three Billy-goats Gruff'. 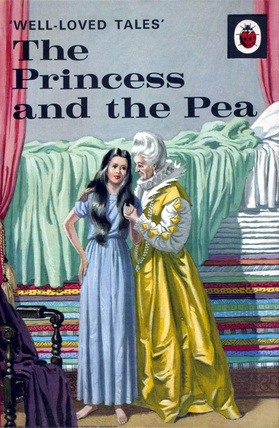 Have you read 'Princes, Frogs and Ugly Sisters' by Dr Allan G Hunter? He goes into the psychology of fairy tales - fascinating stuff.